Great guitarists dont just turn up out of nowhere. Case in point, guitarist David Pritchard released his Vertical Eden CD back in 2008 and in 2010 he digs into his vaults for the first ever CD reissue of his 1981 album Metal Roads. 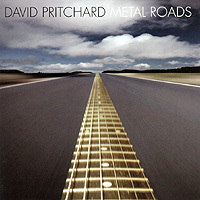 In recent years, Pritchard has become famous for recording multiple acoustic guitars-based instrumental music, but for Metal Roads the sound is pure, late 70s / early 80s fusion music with one ear turned towards American jazz rock and another towards the Euro centric sounds coming from the continent back in the 70s. At seven plus minutes, the CD closer Nuclear Casino sounds a little like Bill Brufords band with Alan Holdsworth circa 1979, or close enough! Produced by Pritchard and recorded in L.A., the Metal Roads CD features eight cuts with Pritchard performing electric, acoustic and classical guitars while backed up by some top players of the day. Released for the first time in 2010, the Metal Roads CD was superbly recorded and new mastering unveils a sonic sheen worth hearing today. A genius of the acoustic guitar, and certainly well worth a listen, Pritchards early electric guitar based fusion sound is put into fresh perspective on the welcome reemergence of Metal Roads. MWE3: How did you unearth the Metal Roads masters and why did you decide to release it on CD now? What was involved in getting the album onto CD and can you give a brief history on the making of the Metal Roads album? DAVID PRITCHARD: Metal Roads was a project for which I could never quite find the right timing or resources to release it until now. I had changed my musical direction to playing primarily acoustic guitar and writing non-improvised music for multiple acoustics so I wasnt compelled to present myself in the jazz/rock arena anymore. But after some urging from several friends that were big Metal Roads fans, I finally decided to release it now. Another consideration was to finally get my whole catalog of recordings out there. I had two technical issues in terms of getting the original analog tape onto a CD. First, as is commonly done with old tapes, I had to have it baked prior to digital mastering in order to re-laminate the backing; that was done in 2000. But then, when I went to get it manufactured earlier this year, the master CDR had deteriorated and was unusable. Fortunately, I had made a couple of CDR transfers which were still good. I began to think I was being punished for waiting so long to release it! MWE3: To my ears the sound of Metal Roads is very late '70s kind of fusion jazz-rock influenced. On reflection, what was your musical mind set and mission on the Metal Roads album and how would you compare that album with some of your other earlier recordings? DP: I was fortunate to be able to put together a group even though we never worked much outside of preparing for the recording. Members of the band were the great vibist Lynn Blessing, who tragically died in 1994, bassist Steve Anderson, one of the most inventive bassists I have ever worked with, Michael Jochum, a superb drummer who has worked in recent years with Jackson Browne and Korn. and finally pianist Rich Eames, a top LA freelancer. The album was recorded almost completely live, with very little overdubbing; the tracks are basically all first takes. We took two days to record and one day to mix. Around the time of Metal Roads I was starting to listen to a lot of contemporary classical music: the minimalist pioneers Steve Reich and Philip Glass, as well as the twentieth century French composer Olivier Messiaen. A couple of the tunes on Metal Roads have references to his masterwork Quartet For The End Of Time which he wrote in a World War II POW camp. Steve Reichs use of rhythmic counterpoints, phasing, and propulsive groove particularly inspired me to try a similar concept within a jazz improvising context. I also was really getting into arpeggiated chords and all their possibilities, particularly rhythmic. I was also into odd time signatures and utilized them widely, having been a Zappa and Mahavishnu fan. Compared to my earlier jazz/fusion work, I think Metal Roads was more experimental, a transition project which has ultimately led me to my writing of music with no blowing sections and concentrating on acoustic and classical guitars. Another factor was that I was tiring of the whole jazz scene, which with a few exceptions, seemed to have become a less creative and inspiring musical genre for me after the excitement and innovation of the late sixties. MWE3: Can you say something about your 1970's session work with Gary Burton, Freddie Hubbard and Patrice Rushen from back then? DP: I never officially recorded with Gary Burton, although a bootleg album called Very Touchy, with me on it along with Steve Swallow and Bill Goodwin, appeared in the late seventies. I sounded pretty raw but then one has to consider that I was barely twenty years old and pretty green to be playing with a big time jazz group. Needless to say, playing with Gary was a real learning experience. For a guitarist, working with Gary has to be one of the best gigs ever and there certainly have been a number of significant players that have worked with him over the years. Freddie Hubbard and Patrice Rushen played on my second album City Dreams. Freddie did his part overdubbed and did his best take before hed even looked at the music! Patrice was a dream to work with. She was only supposed to do one tune but ended up doing the entire album. Certainly she is one of the best musicians I have ever worked with and her solo on the track Bright Depths from the City Dreams album is absolutely breathtaking! MWE3: How would you compare the sound of Metal Roads with your more recent approach to guitar instrumental music, especially in light of your 2008 Vertical Eden CD and would you consider returning to recording in a more rock based jazz style? DP: As I mentioned earlier, Metal Roads is really a transition project which ultimately led to my change of musical direction into the acoustic realm starting in the late eighties. Nonetheless, Metal Roads still has a freshness about it and I think it holds up quite well after nearly thirty years of being in the can. It doesnt neatly fit into any preconceived style of jazz or jazz/rock playing. Although, maybe from a Luddite perspective, I still prefer the simplicity, lack of gimmicks, and directness of playing acoustic. However, I cant say I will never again play electric and a style of music similar to what I was doing on Metal Roads. Well see if the opportunity arises and what happens in the future. I do have a few post Metal Roads type compositions that I never recorded and would love to do so at some point. MWE3: Can you say something about the guitars you featured on Metal Roads compared to the guitars you've been featuring on some of your recent recordings? DP: On Metal Roads, I used an early seventies Les Paul Custom, a Gallagher acoustic, and a classical guitar by Los Angeles luthier Julius Gido. Of those instruments, the only one I still have is the Les Paul. The acoustics I use now are a steel string by Ken Franklin and a classical by Angel Benito Aguado.